Over 50 Historic Train Cars on Site! Jackson Street Roundhouse was built by James J. Hill in 1907 as one of the Great Northern Railway's steam engine maintenance facilities. Sitting on 9 acres, less than a mile north of downtown Saint Paul, the property houses the Museum, Restoration Shop, Blacksmith Shop, Rutledge Depot, and our train yard filled with historic cars and vintage buses! 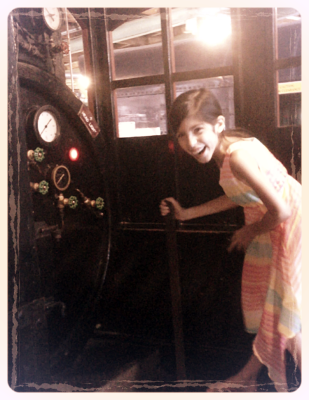 Travel through history with exhibits featuring local and regional railway and bus history. Explore 50 historic train cars on site and housed in a building that represents a significant part of Twin Cities history. Experience a genuine operating roundhouse turntable, one of the last of its kind in the country. Witness restoration of historic railway operating equipment and view blacksmith demonstrations in our forge! The best part is we offer REAL TRAIN RIDES EVERY SATURDAY- rain, snow or shine come and ride with us! In the winter, visitors can cruise the rails in a heated caboose for 15 minutes down the line. No need to pay extra for this experience because its part of your admission! No train rides on Wednesdays. Blacksmith Shop is currently closed. *Friday hours June 7 through August 30, 2019 only. **Drafts & Crafts is an evening program every first Friday, June through September, from 3pm to 8pm. Tickets are $15 per person. Admission includes beer samples and a train ride. Walk-ups always welcome, but for faster entrance, purchase tickets online, and check-in at ticket counter upon entering!